We are about to get the pattern for the 1927 Gloster IV. Two were sent to Venice N222 and N223. From descriptions of the race, both aircraft used the cruciform tail, and whilst we can find pictures of N222 in this configuration, we can only find the round finned version of N223. So my question is - were both aircraft the same spec or was N223 only modified after the race? My understanding is that only the A version, N222, had the cruciform tail, whereas the B, N223, with a geared Napier Lion, had the rounded fin. I will check further my references, but I would venture you are OK if you stick to this. Photos are often mislabelled between the three Gloster IVs. Which leads to another question : will you release the VI, the most beautiful Schneider racer IMHO, any time soon ? I passed on the Renaissance one because it was the wrong scale, in 1/24. The kit is limited to 150 copies only. Wow, that is a cool looking plane!!! Not sure how the pilot sees where he is going, but sure has style. Fantastic, I have already ordered one, should get it next week. It will join the Supermarine S6, Supermarine s4 and the Macchi M.52 on the shelve. 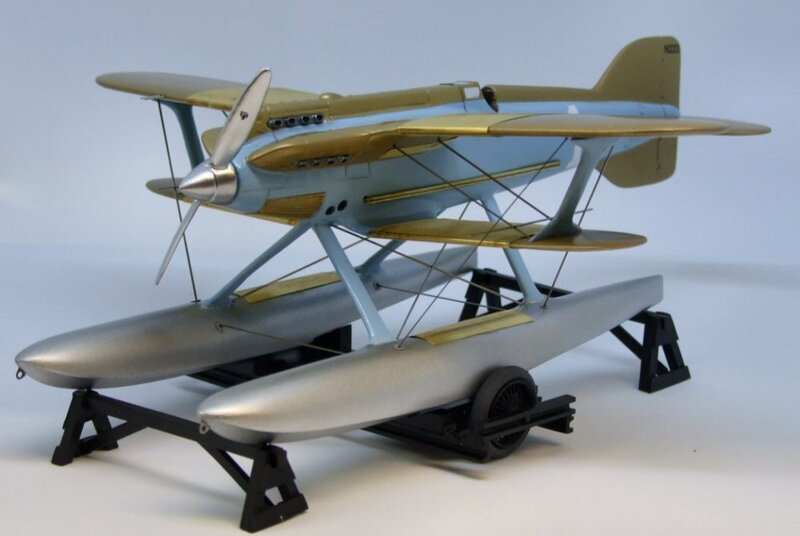 Might have to get the Supermarine S5 too; the Schneider racers I think are my all time favourite aircraft. I did also build the 1/24 Profile24 Gloster VI a couple of years ago, a beautiful aircraft. Hi Iain, Fantastic subject, Could you post some pictures of the parts please?